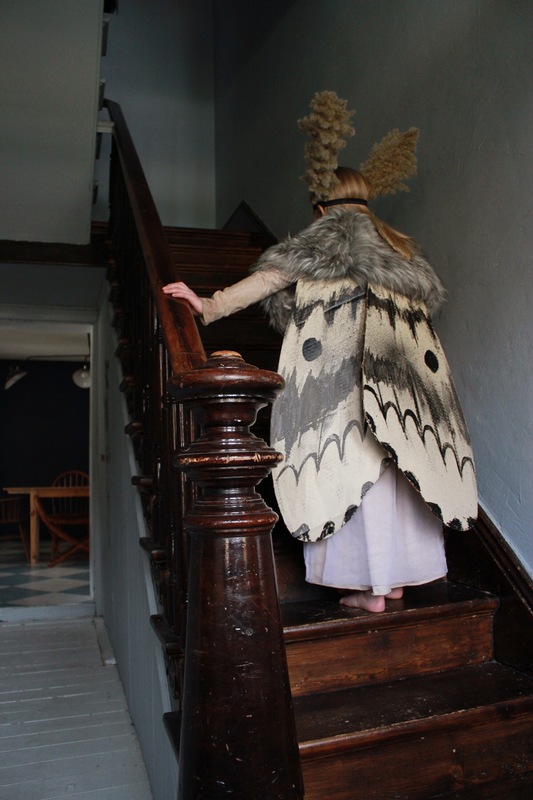 We’ve had a bit of a moth infestation over her at the Banister house. 😉 Good thing it’s so cute – as we just might have to keep her. Believe it or not, most things I do for the blog are in real time. Aside from projects for magazines, collaborations, etc. I do things right along with you. When it’s spring, I create in the spring. 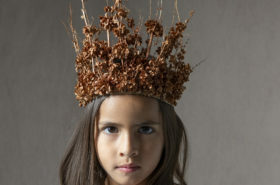 When it’s fall – I create for fall in the fall. I’d like to say it’s because we’re really present and mindful (and hey we do strive for that) but a lot of times it just means I’m living life and without a team (I run things solo – so whenever I say “we” I’m referring to my family – as they are part of this family biz thing) and getting ahead seems just so darn art. I also like to be inspired by what is actually the season around me. Which sometimes means that the ONLY costume I make for 2018 (the Better Homes ones I technically made in late 2017) ends up being created on the actual day of Halloween. I sent Amelia to school in her black kitty fairy costume she requested (thank you Nununu for the darling tutudumonde collab dress. so perfect!) and the boys – well Atticus put together a fox rapper costume and Oliver wanted to wear a reaper cloak from another year. So easy peasy. Except I hadn’t made one. single. thing. Woohoo! Right? And with so many deadlines looming over me (lots of kid book illustration projects) I should have take the out this Halloween. I really should have. But I. just. couldn’t. Because, well I’m ME and I’ve had this moth costume idea stuck in my head for forever and I could tell bad things were going to happen if I didn’t give birth to it. Like it would haunt me and send real baby moths to come and infest my house…for real. 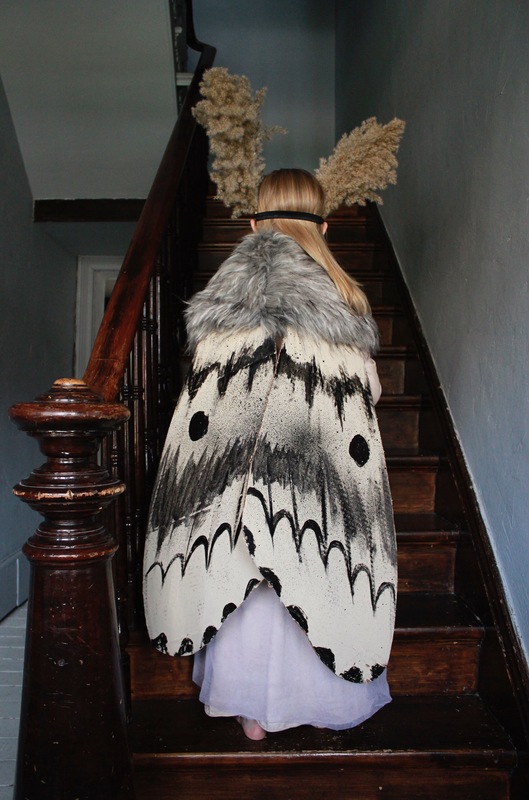 So like all good creatives, I listened and obeyed the muse and made this moth costume while Milla was at morning Kinder. 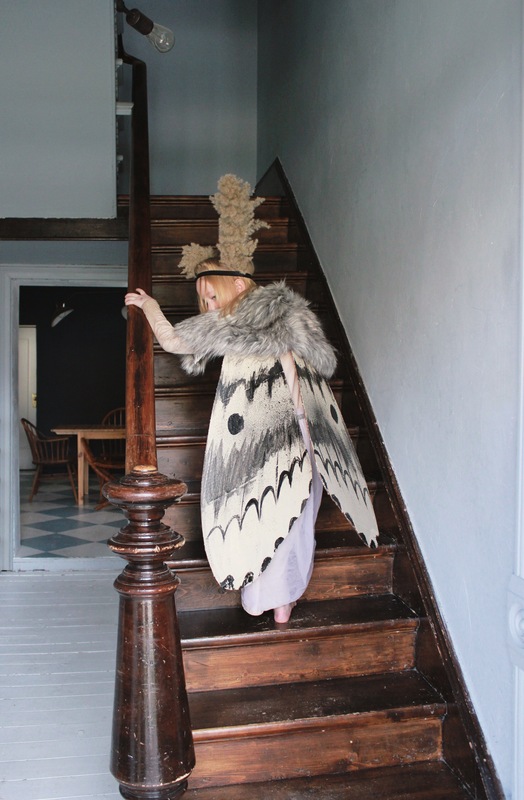 And thank you once again Nununu for making this gorgeous and kid comfy victorian dress, which just so happened to work perfectly for our moth costume as well. I cut out a few wings from cardboard, splattered and painted them and threw some elastic on them to keep them on her arms. I had fun finding a way to let the wings live freely a bit, so they could flap or overlap on top of each other. I did this with adding a strip of elastic between the wings up top (each wing is a separate piece of cardboard) with hot glue and duct tape, because I couldn’t think of any other way to do it on the fly (pardon the pun ;)). And it worked! I hope you are all had a safe, fun and delightful Halloween! Until last minute next year! Oh my GOODNESS. This is the most gorgeous costume I have ever seen. I adore moths and this really does them justice! WOW. oh thank you Rae. It was such a fun one to make. A favorite here as well.